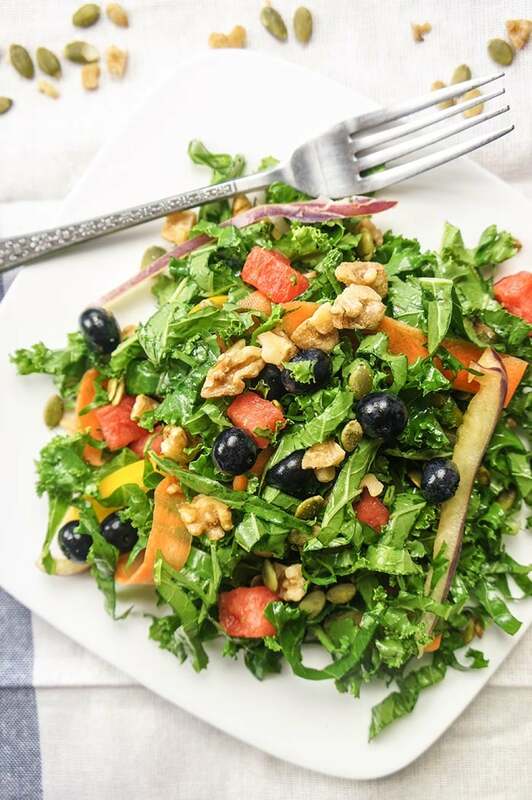 Summer is not quite over yet, and I’m not done devouring Summer Superfood Kale Salads yet, either. Summer foods have always been my favorite. Berries. Watermelon. Huge salads. 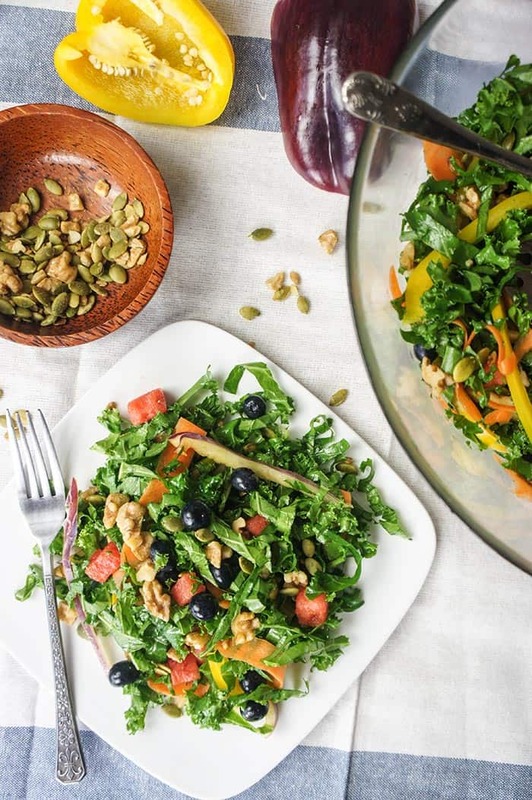 This salad combines the best of them, into an seriously tasty salad that packs a hefty nutritional punch. When I started blogging, I thought being around so much beautiful food all the time would lead me to overeat. Instead, I find that I spend so much time perfecting how the food looks, I don’t want to touch it and ruin it, so I don’t pick at it at all while I am taking the photos. . . .until this salad came along. Chunks of watermelon, blueberries, colorful peppers. . . these foods are my weakness. I kept grabbing bites of the salad, and then having to rearrange it to fill an empty spot. It was a quick photo shoot, because I couldn’t wait to eat it- as my afternoon snack! I saved a little bit for dinner . . .
I’m a little late with the watermelon recipes this summer. I have 1 more to come next week. I am sure lots of you will have watermelon left over from your Labor Day picnics! Blueberries: Listed as one of WebMD’s “superfoods everyone needs,” blueberries have earned the title for several different reasons. They are high in antioxidants, warding off cancer. Inflammation leads to illness and disease, and blueberries are anti inflammatory, and so help boost immunity and well being. Watermelon: Watermelon is a great summer food because it (tastes amazing!) is seriously hydrating, being 91% water. It’s high water content also makes it a low calorie summer treat. The high potassium content has led watermelon to being touted as the next “coconut water,” but not only is potassium important for hydration, it’s also a key nutrient in healthy kidney and heart function. Bell Peppers: I added yellow and purple bell peppers as a nod to amazing summer produce, and to give the salad all the colors of the rainbow. Bell peppers are also a great source of vitamin C. One bell pepper has twice the nutrient than an orange! The nutrient load in bell peppers improves eye health and prevents inflammatory diseases such as arthritis. Pumpkin Seeds: Pumpkin seeds are full of the amino acid tryptophan (like turkey! ), which lowers anxiety, but also lowers cholesterol and helps fend off cancer. Walnuts: A salad favorite of mine, the healthy fats in walnuts and other nuts (eaten 5 days a week) can cut your risk of heart attacks by as much as 50%! Walnuts also reduce the risk of diabetes. Sure, they’re high in fat, but the health benefits are indisputable. You can choose high calorie, disease fighting nuts, or spend your calorie allotment on sugary, nutrient-empty wheat flour treats. Pass the walnuts, please! 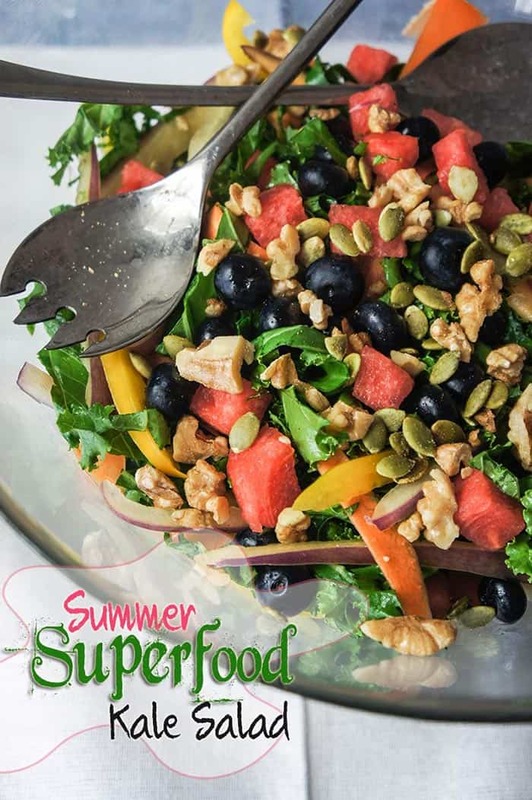 A fresh summery kale salad packed with superfoods to help you feel your best. Remove the stems, and finely shred the kale. Mix all the dressing ingredients together, making sure the honey is dissolved and mixed in. Pour the dressing over the kale, and massage it in to soften the kale. Place the kale in the refrigerator to keep cold while preparing the rest of the ingredients. Finely slice the peppers, and cube the watermelon. I used a vegetable peeler to cut the carrot into long thin strands. Toss the fruit and vegetables with the kale. Toast the chopped walnuts and pumpkin seeds in a skillet over medium heat, stirring occasionally to keep from burning. Add the nuts over the salad directly prior to serving to keep them crunchy. Your salad looked amazing, too! I always put kale or spinach in my salads. Great photos too! Kale and spinach... and I love crunchy romaine, too ... make the best salads! I have a hard time eating meals without one of them! 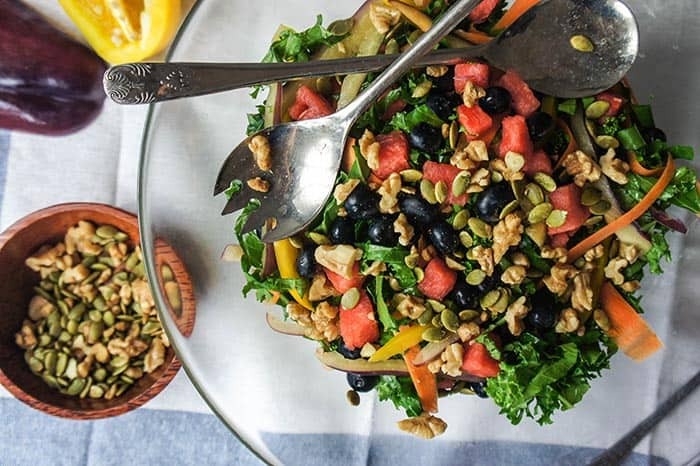 I'm definitely going to start stalking your blog, the summer salad looks so yummy I'm sure it be a hit with the kids too... never thought about combining watermelon with peppers, am raring to give it a try. Thank you! Yes, kids love to have sweet in salads! This salad looks so vibrant, delicious and healthy! I want to grab a bowl of this for any meal. Walnuts and pumpkin seeds are two of my favorites. Yes, nuts on salads are so yummy. I hardly eat salads as I'm more of a meat person but this salad looks tantalizing! I liked salads especially different kinds of veggies, nuts, oil or mayo but not pumpkin seeds. It seems excellent kind of salad. Thank you! Yes, I like to experiment with a lot of different toppings. I pretty much live off salads, so need to be creative! That's right! These ingredients are great for skin health, too. Your salad is something I would love to try for the first time. Summer here in our country is the time to munch on those crunchy and juicy watermelons. I love how nutty and crunchy the salad is! Such a delicious idea! Yes, love nuts in my salads! Great way to add crunch and super nutrition. I love adding sweet fruit to veggie packed salads! Gives them so much flavor. Another healthy salad! And I love it this summer. Looks so tempting! Great recipe on salad!